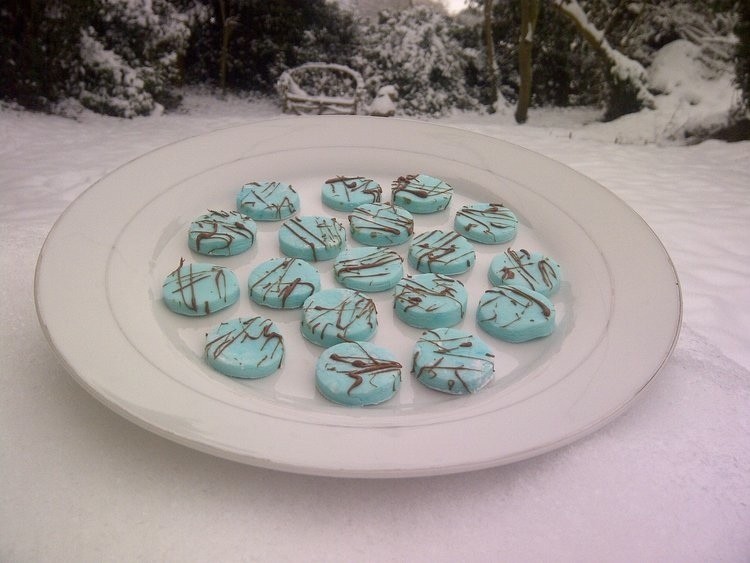 After the trickiness of last week’s macaroons, we decided to try something much simpler this week; peppermint creams. My son and I made these. 1) Sift the icing sugar and then work in the condensed milk, peppermint oil and colouring (if you’re using it). We found that we needed a bit more condensed milk than the suggested amount, but you’ll be able to judge that as you work it in. The quantity of peppermint oil will depend on how strong you like it, we used two little capfuls. 2) You’ll end up with something resembling a dough. Roll it out to your desired thickness on a surface dusted with icing sugar, and then cut circles out with a small round cutter. 3) Melt chocolate and drizzle/splatter it over the peppermint creams. We used a teaspoon to do this from quite high above them. Leave them in a cool place to set. The quantity that we have on the plate in the picture is about a third of the total yield. These would make a lovely gift. Either in a pretty little box, with something like greaseproof paper in between each layer, or gather a few up into a piece of cellophane and tie with some curling ribbon. 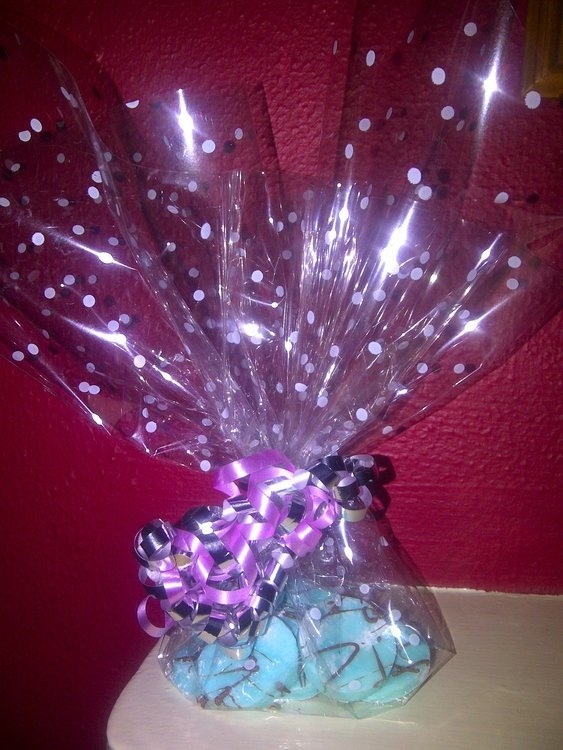 I have a big roll of this dotty cellophane which is really handy for making gifts. My daughter suggested that instead of blue peppermint creams, you could use a few drops of red colouring to make them pink, then use a small heart shaped cutter instead of round, drizzle the chocolate in the same way, and you have a lovely valentine’s gift. Very cute. I like the blue. I made my sister peppermint creams last Christmas along with the recipe. She hadn’t had them since we were kids so she was delighted. I made swirly green and blue ones. Yours look more tempting. I like the hearts idea. Might make some for valentines day. (And eat them all myself). I love the valentine-pink idea! I think I make more of an effort to be neater when I know I’m going to be photographing them for this site! Also, I pick the best looking ones to photograph, there are always lopsided rejects (they still get eaten of course!). Yes, my son has always enjoyed cooking. I think he likes the science of it if that makes sense. Both my kids can knock a meal together and do some baking. What I need is….for you to come to USA and bring those with you oh my gosh they look way to yummy!! I would love to! But in the meantime, you can always make some yourself, they really are so simple! Gosh, I think you’re a bit of a cooking goddess!! I don’t think I read the macaroon post, but I remember seeing the photo on my reader and thinking: it’s so nice to see what happens when real people make macaroons, rather than staring at a perfect photo in a cookbook and thinking: there’s no way mine are going to look like that. I’m really not a cooking goddess, although I do seem to be more successful with sweet things than with main meal type things. Yes, I had been hoping my macaroons would look like those perfect ones in cookbooks, but once I had accepted that they weren’t going to, I was reasonably happy with how they came out! Great, simple recipe that even I can follow…I shall try them at the weekend 🙂 Thanks, V! Do let me know how they go if you make them! I’m particularly interested to know whether you had to add more condensed milk than it says, like we did. Ooh yes, that’s an idea, although you’d need quite a bit of food colouring to get the true Christmassy red and green! Yums. Your website makes me so hungry. Ha! (I don’t know what else to say). Nothing! Don’t mind me, I’ll just sit here staring at the yumminess.